Do you know fatty acids are the basic unit of which macromolecules? Fats are esters of high molecular weight containing Fatty acids(FA) and Glycerol. Glycerol is a trihydric alcohol and therefore one two or all the three hydroxyl groups (OH) can react with FA forming mono, di or triglycerides respectively. fatty acids are the basic unit of which macromolecules? FA is the basic unit of which macromolecules? fat contains how many fatty acids? how fatty acids are stored? how many fatty acids are found in neutral fat? how much fatty acids do we need? where are fatty acids made? where are fatty acids stored? Where are fatty acids synthesized? where do fatty acids come from? These are the basic questions. To solve this read this basic guide on Fatty acids (FA) before going to the next level. Alcohols commonly include Glycerol, Cholesterol and higher alcohols such as cetyl alcohol and myricyl alcohol. IUPAC name of the Glycerol is Propane-1,2,3-triol (or) 1,2,3-trihydroxy propane. Commercial name is Glycerine, which is using in the automobile industry as lubricating agent (It reduces friction between two metal bodies). The other unsaturated alcohols are Phytol (in chlorophyll) and lycophyll pigments (in Tomato). 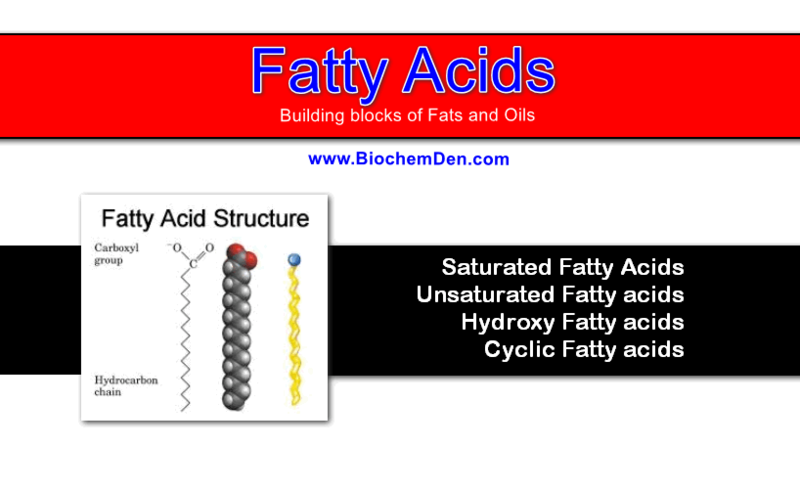 Fatty acids are long-chain organic acids having usually from 4 to 24 carbon atoms; they have a single carboxyl group and a long, nonpolar hydrocarbon ‘tail’, which gives most lipids their hydrophobic and oily or greasy nature. They do not occur in the free or uncombined state in cells or tissues but are present in a covalently bound form in different classes of lipids. The systematic nomenclature of the FA is based on the Geneva system. The names of saturated FA end with the suffix -anoic and those of unsaturated acids with the suffix -enoic. The numbering should be should start from Carboxyl group (C1 of the Head region). The Greek lettering should be starting from first -CH2- group (C2 of the Tail region). The SFA contains only a single bond, which has no double bonds. 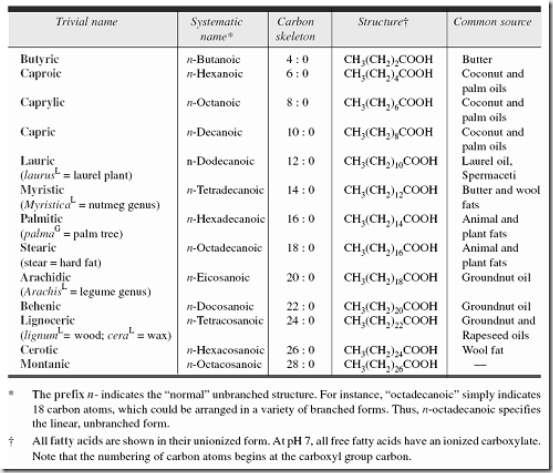 In animal fats, palmitic and stearic acids (C16 and C18) are the most abundantly found SFA next in order are shorter chain fatty acids (C14 and C12) and long chain fatty acids (C20, C22, and C24). Some branched chain FA are isopalmitic acid(C16) present in Wool fat, Anti-iso palmitic acid(C17) present in Wool fat, Tuberculostearic acid (C 19) present in Bacteria. The USFAs contain double bonds in their structure. A. Monoethenoid acids — These contain one double bond and conform to the general formula, CnH2n–1COOH. The common example is oleic acid. B. Diethenoid acids — Two double bonds; CnH2n-3COOH; Linoleic acid. C. Triethenoid acids — Three double bonds; CnH2n-5COOH; Linolenic acid. In mammals, polyunsaturated FAs can have up to 22 carbon atoms and 6 double bonds, but in plants, these acids do not exceed 18 carbon atoms and 4 double bonds. The human body can convert Stearic acid to Oleic acid by inserting a double bond but is incapable of inserting further double bonds so that the Oleic acid cannot be converted to either linoleic, linolenic or arachidonic acid. Vegetable oils contain two types of polyunsaturated FAs (PUFAs) – linoleic acid (lin with 2 double bonds) and -linolenic acid (len with 3 double bonds). All USFA are more stable in “Cis-configuration” than “Trans configuration”. USFA has “Non-Conjugative double bonding system” (or) “Cumulative double bonding system”. Some of the FAs have a hydroxyl group in their structure. Examples are Ricinoleic acid (87%) in Caster oil, It is a C 18 acid with a double bond at C9 and an OH group on C12. Cerebronic acid, a C 24 acid obtained from animal lipid, is another important hydroxyl acid with an OH group on C2. A common oxygenated fatty acid, isolated from plants and bacterial lipids, is 9, 10- dihydroxystearic acid. Another example is 9, 10-epoxy-stearic acid is isolated from rust spore lipids (20%). These are in Cyclized form FAs. Examples are Chaulmoogra oil obtained from Hydnocarpus kurzil contains Hydnocarpic and Chaulmoogric acid. These two cyclized FAs are using for the treatment of Leprosy. Chaulmoogric acid has a cyclopentenyl ring in its 18-carbon structure. What is Gluconeogenesis? What are the Steps and Importance in Metabolism?